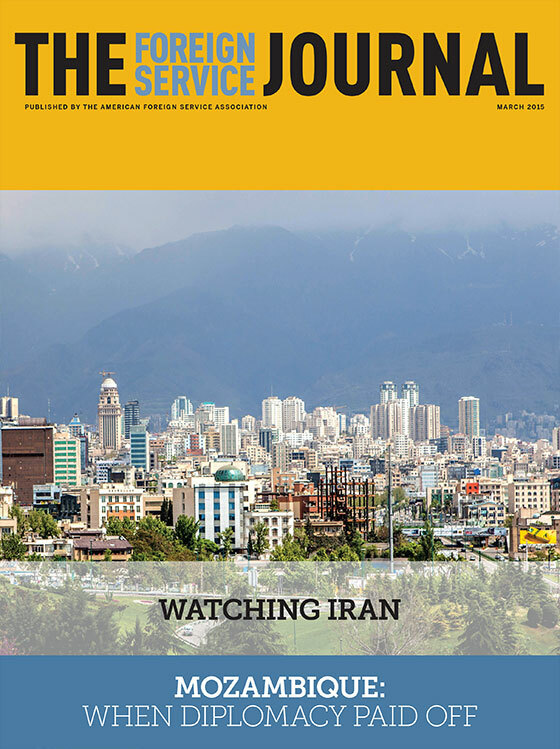 The March issue focuses on Iran and how lessons of the past may inform the future of diplomatic relations. Recently retired FSO Jillian Burns assesses the Iran Watcher Program, a decade-old program which provides critical information for current nuclear negotiations. Former Iran hostage Ambassador John Limbert shares his own experience and historical lessons to explain what it will take for Washington to “get it right” if U.S. diplomats return to Tehran. Michael Metrinko, retired Foreign Service officer and former Iran hostage, recounts his story of 14 months of imprisonment, most of it spent in solitary confinement. Elsewhere in the issue, Ambassador Willard DePree reflects on critical moments of diplomacy with Mozambique that had clear and measureable results. Also included is a tongue-in-cheek examination of the interesting—albeit short—Foreign Service career of former New York mayor Fiorello LaGuardia from author and former FSO Luciano Mangiafico. A veteran FSO and authority on Iran explains what it will take for Washington to “get it right” when U.S. diplomats finally return to Tehran. In the face of numerous challenges, diplomacy played a vital role in post-independence Mozambique and the Southern Africa region.